Canadian. Originally born in France, Helene has lived in Montréal for more then 10 years. Singer, musicologist, composer, lyricist and arranger. Graduated in Music Therapy at UQAM. 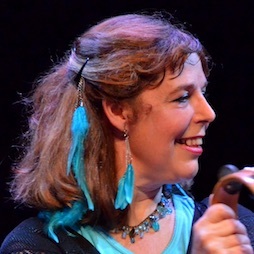 Classically trained singer performs in Yiddish, English and French Ms. Engel performs in various shows within and without the Jewish community. She also occasionally serves as a cantorial soloist at Temple Emanu-El in Montréal. She is also a music therapist, and works in such things as healing services, oneg shabbat in long term care units etc. Ms. Engel has performed in opera in Paris and other locations in France, in such roles as Cherubino in Le Nozze di Figaro; in Le Pont des Soupirs (Isabelle) at Théâtre de Paris. She has toured Europe and Canada. She has recorded 4 CDs. Her recordings include Chansons traditionnelles juives; La Serena – Chansons judéo-espagnoles; Errances; and Ay Lu Lu. She has been artist-in-residence at Saidye Bronfman center in 1997 in “Judéo-Madrigal” and in 1998 “Comptes de fées” with the clients of an abused women shelter, Auberge Shalom.